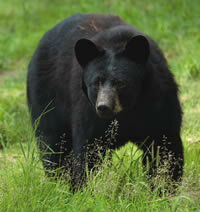 A black bear found dead in Hyde County has tested positive for rabies — the first known case of a rabies positive black bear in the state, according to the N.C. Wildlife Resources Commission. •Do not handle or eat any animal that is acting abnormal or appears to be sick. •Wear latex or rubber gloves when field dressing; never handle a dead animal with your bare hands. •Minimize the handling of the brain and spinal cord. •Do not allow pets around your field dressing area to prevent contact with saliva, blood and other tissues. •Wash hands, boots and instruments thoroughly after field dressing is completed. •If a deer or bear is commercially processed, request that animal be processed individually and without meat from other animals. •Use proper cooking temperatures to ensure safe food.